Guide fee, guide's expenses, dinners, breakfasts, and hot drinks while in the mountains, group climbing equipment and camping gear. Transportation to/from the course area, personal lunch food, personal climbing equipment, trailhead parking pass fees. We started as a mountaineering school for high school students and want to continue our tradition of introducing young people to the mountains. This 6-day mountaineering seminar takes place on majestic Mt. Baker and provides the opportunity for young climbers looking to gain a well rounded basic skill set in glacier mountaineering. 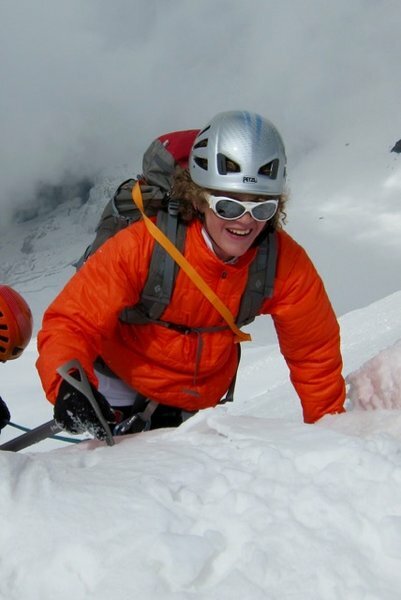 The curriculum of this program is very similar to the 6-day Glacier Mountaineering Course we offer for adults, but the pacing, equipment, and guide staff is a bit more tailored to working with young climbers. The program is open for students aged 14-17 with either some or no previous mountaineering experience. The most critical element that each student can bring to the program in enthusiasm for learning to become a safe and proficient climber. 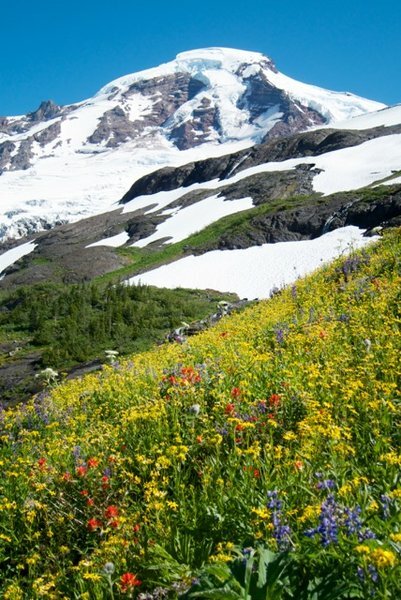 The foundation provided by this type of course can open up a lifetime of mountaineering enjoyment on the glaciated peaks of the Pacific Northwest. Course content is detailed below, but the main objective is to developed well-rounded young climbers and to demonstrate how to take care of yourselves, your team, and the natural environment while climbing one of Washington's most iconic mountains. We will start with a very careful review of all the gear needed for our 6-day stay in the mountains and will then pack up and head for our first camp. Once on the mountain we will practice building and maintaining safe, discreet camps, and then move onto basic skills such as using the ice axe, traveling roped together, and preparing and cleaning up mountain meals. During the week you will be given the opportunity to climb to the summit of Mt. Baker, will do some top-roped ice climbing, will be introduced to crevasse rescue, will learn to build bomber rock and ice anchors, and hopefully make some new friends. It is impossible for the guides not to also throw in some basic education surround this beautiful landscape and we will talk about the common plants and animals we encounter and explain the interesting geology of Washington's volcanic landscape. We ran our first program like this in 1996 on Glacier Peak and 20 years later we stay in touch with many of those students who have now moved on to have big careers and even kids of their own. Why choose us: John & Olivia Race have deep expedition climbing experience developed during 30 expeditions to Denali, 8 expeditions to Cho Oyu, Everest, & Shishapangma, and a dozen trips to Aconcagua. They also now have 2 kids, one aged 19 months and the other closing in on 5 years. John & Olivia see a very significant need for opportunities for young climbers to experience our great local mountains and ran a program similar to this for the first 10 years that they were in business. John and Olivia are IFMGA guides, the highest level of training a mountain guide can aspire to and increasingly a viable career path for young people looking for a rewarding career spent outdoors. John will be leading this first program and if needed will be assisted by other guides with experience working with young climbers. Day 1: Student drop off at 8:00 am in Sedro-Woolley, WA. This is about 1.5 hours north Seattle. We will do an equipment check and make sure that we have all the essentials and manage to pare out things that will add extra weight and are unneeded. We will then drive to the trailhead and hike about 4 hours to our first camp, near a glacier. Most of the afternoon will be consumed setting up camp and making dinner, but there is usually time for an evening lecture on something like Leave No Trace or basic climbing knots. Day 2: Every day in the mountains starts with breakfast and clean up. 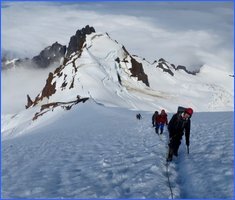 After this we will move out onto the glacier and train with our ice axe, crampons, and eventually incorporate the rope. This will serve as the foundation for the rest of the week. Topics include parts of both the ice axe and crampons, how to rest step, how stop yourself using self-arrest, how to stop your rope team using team arrest, and how to crampon for maximum purchase on the ice and how to keep your feet from catching on one another. Master these skills is the prerequisite for moving on to roped glacier travel. For roped climbing we will practice all the knots used to tie into the middle or end of the rope, how to communicate when moving, how to layout the climbing rope for different terrain types, and how to coil and stow the rope you do not need. These skills generally can be taught before lunch and then we will spend the afternoon exploring the glacier, weaving in and out of crevasses, and really getting smooth at roped glacier travel. We will finally conduct a detailed course in glacier mechanics and explain how glaciers are formed and explain how they move as they slowly slide down the mountain. A solid understanding of glaciology is the basis for good route finding when moving up the mountain and something that we are lucky to be able to observe here in the Pacific Northwest mountains. At the end of this first day we start to talk about snow and ice anchors. We will practice making solid anchors using ice screws, snow pickets, bollards, t-slots, and consider natural features. Once we can do each of these well they will be incorporated into ERNEST anchors and we will focus on making anchor systems that are strong enough to perform crevasse rescue, rappel, or set fixed lines for rescue practice. All of this training is heavily modeled on the training found on the courses guides take to become certified and from the foundation for doing crevasse rescue. A portion of the group will cook dinner and after dinner is cleaned up we will have a short lecture on a relevant mountaineering topic: altitude illness, hypothermia, or the weather we are experiencing....hopefully sunshine! Day 3: On Day 3 we usually want to move along to a new camp location and undergo the process of packing up camp and making sure that we are leaving little evidence of our old camp before moving up the glacier to a new site. This next camp will be on the glacier itself and will give us the opportunity to establish a deep, comfortable kitchen, build flat snow platforms for the tents, and be in position to endure any bad weather that may come our way. We will also look for a suitable crevasse to practice crevasse rescue. Each student will be given the opportunity to be lowered into a crevasse on a climbing rope (with a backup safety line) and climb out using mechanical ascenders, ice climbing technique, or simpler systems such as prussics. In the evening we will have a team meeting to discuss the next day's planned summit climb, and try to get to bed early for our pre-dawn summit attempt on Mt. Baker. Day 4: We will wake up when it is still dark, have a quick, light breakfast, and then head for the summit. The summit day requires traveling roped together using ice axes and crampons. The real learning here occurs as you fine tune your skills for dressing so that you are not too warm and not too cold and setting a pace that allows you to walk all day without getting overly tired. The climb up usually takes 4-5 hours and the descent takes about half that time. From the summit on a clear day you can truly see for over a hundred miles and for most of us it will be a highlight of the summer. We usually shoot to be back in camp mid-day before the glaciers get too warm and often take a huge nap before waking up and having dinner. In the evening we will discuss the climb, clear up any areas we have covered so far and make a plan for our last full-day on the mountain. Day 5: This day gives us the chance to really dig into fun topics like ice climbing, move camp back to a lower elevation, and focus on any skills that we have not had a chance to cover in as much depth as we wanted. It also can serve as an alternate summit day if the weather did not cooperate on the previous day. Day 6: Most of this morning will be spent packing up camp and getting ready to make an orderly exit to the trailhead. On this morning we like the guides to give each student feedback on areas where they did well and given them tips on how to keep practicing skills where they still need to improve. Once back at the trailhead we will get back all the group gear, centralize any garbage, and get ready to go down and meet our families in Sedro-Wooley. No trip to the North Cascades can finish without a solid meal and we have a few spots we like that serve pizza and ice cream in extra large portions. Note: This itinerary is representative of a typical trip, but may vary quite a bit given things like group strength, weather conditions, etc. You do not need previous climbing experience to do this trip, but you do need to show up psyched to climb. The combination of variable temperatures, possible bad weather, long trails, and heavy packs makes this possible only for people that want to do it. Most students will be entering 9th through 12th grade. We are open to students outside this age range, but you so need to be physically and mentally ready to be part of a climbing team. Probably the best idea is to call the office at 509-548-5823 to discuss the trip. We realize that $1425 is pretty steep for a summer camp experience. We are willing to work with motivated students to adjust the trip fee and rental fees if needed. As they say, "there is no free lunch," so if we do adjust your fee, we would like to see you reciprocate by finding some local cause to volunteer some time and energy to. All of our guides have many stories of the sacrifices they made as young climbers to spend time in the mountain. Parents likely won't be supportive of a plan that involves living in your car while travelling the West, but most will support some sort of contribution of time and energy to helping build local trails, lending a hand at a local charity, etc. Who am I sending my kids out with? This is often the biggest hurdle for the parents. John & Olivia Race run the Northwest Mountain School, which John started in 1994 specifically to provide mountaineering instruction to young climbers. We wound that business down in 2003 because it was losing money. John is going to lead this first trip and is an IFMGA guide. We have 2 children aged 1.5 and almost 5. As we have aged our risk tolerance has dropped dramatically and it has become more pronounced now that we have our own kids. Maintaining physical and mental safety is our chief concern on all of these trips and we would not want your son or daughter to go on our trip without first talking to us. We can provide parent references if needed. All of our guides have the usual expected training such as in first-aid, CPR, but more importantly they have years of experience guiding and a skill set that helps us avoid using our medical training. We provide all of the group gear on this trip. This includes tents, stoves, climbing ropes, first-aid kits, communications equipment, pots, pans, etc. We also provide harnesses, helmets, crampons, ice axes, and have some backpacks that we can loan out. You will need to bring all your own clothing and times like a cup, bowl, and spoon. As you get ready for your trip we can assist with me of the hear if we have extras and we will have some gear available for rental. Our goal for this first trip is to make the thing happen and we will do what we can to keep your rental costs down and your need to purchase a bunch of new gear to a minimum.